(But feel free to read more below). 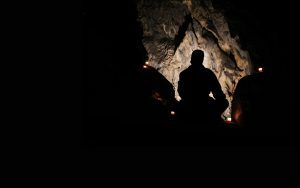 Join Modern + Mindful and Canmore Cave Tours for a once in a lifetime experience. You will meet at the Canmore Cave Tours office at 3pm, to learn more about what is coming up for the evening, and receive all of your gear. After a debrief, it’s off to the trailhead for a beautiful and mildly strenuous hike up the mountain to the entrance of the Rat Nest Caves, with a short experience of forest bathing on the way up the mountain. At this point you will get your caving gear on, and begin your mindful adventure inside the mountain. Following the guides, you will explore into the caves, to the grand gallery where a candlelit meditation awaits. Post meditation, enjoy a warming cup of tea before you begin the exploration out of the mountain into the woods, where the hike down the mountain is the perfect cool down to your entire evening.